Claddagh Ring is a powerful symbol of Love, Loyalty and Friendship. 9K Gold Ladies Claddagh Ring. Irish Jeweler strives to keep the Irish Cladagh tradition alive. Claddagh Ring, obviously a timeless piece of Irish Jewlry. Made of high polished Gold features a distinctive feminine feel. Crafted in Ireland, this Ring showcases a highly polished finish. All our Claddgh Jewelry and Claddagh Wedding Rings made in IRELAND and hallmarked in Assay Office located in Dublin Castle. Also simple in design this ladies plain Claddagh Design makes a perfect gift for your loved one and ideal for both him and her. Indeed the Irish Claddagh, probably the most culturally rich pieces of jewelry ever recorded in history. 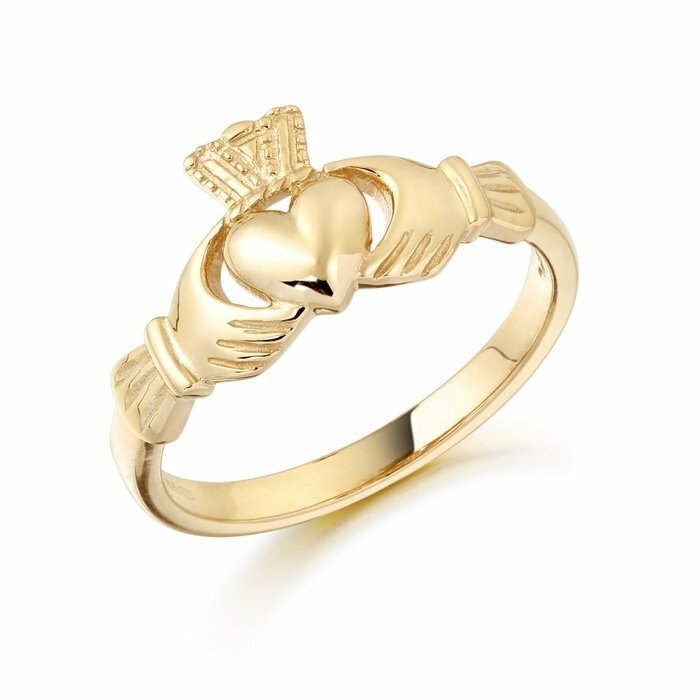 Moreover inspired by Ireland’s rich Celtic heritage, the Claddagh makes a powerful symbol of Love, Loyalty and Friendship. Add your own chapter to this unique love story with our beautifully crafted Irish Jewelry. Featuring two hands clasping a heart surmounted by a crown, a wonderful way to express your deepest love and commitment with this exquisite Ring. Finally the design of the Cladagh and even the way the Ring is worn are all deeply rooted in Irish tradition. Irish Jeweler strives to keep the Irish Cladagh tradition alive and creates the world’s best Claddagh Gold Rings.